In Dinner Survival, Sandi passes on her vast personal experience and that of the hundreds of families she’s studied and advised. Don’t take hours of precious weekend time to cook, she says. A little preparation—chopping and freezing a few ingredients—will make a huge time-saving contribution to the busy workweek. The book is packed with nutritional information and substitution charts that will keep everyone at their best. And of course, all the meals will help your family maintain a healthy weight and a healthy body. Save time, money, health and peace of mind with Sandi Richard’s simple, great-tasting plan for dinner. Is Guilt from the Lack of Time Keeping the Family from Optimum Health? How Convenient Is Too Convenient? Will the Real family Please Stand Up? Dinner is a lot bigger than food. It’s about family, health—both physical and spiritual—economics, commitment, time and your sanity. And whether you love or hate to cook, chances are you really don’t like it much during the workweek. But what if everything was organized for you, from shopping lists to 10 weeks of meals? What if you could involve everyone in the process, from choosing menus to helping get food to the table? What if each meal just took as little as 20 minutes to prepare? Meal planner and mother of seven Sandi Richard will help you achieve dinner hour, without stress and struggle. She will free you from your feelings of guilt over falling into the take-out trap—and show you how to plan, shop, prep and cook fantastic-looking and -tasting meals that even a picky 6-year-old will like. 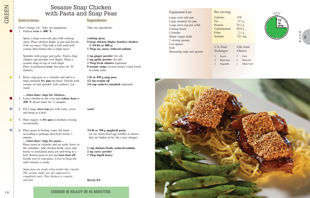 Dinner Survival™ teaches you to create your own Eat Sheets™ using the recipes you love. Dinner Survival™ contains all the key components which make each of Sandi Richard's books national bestsellers. Dinner Survival™ has ten nutritionally balanced weeks of five dinners, including completed Eat Sheets™ (grocery lists) for each of these weeks (in each book and printable off our website).